Whether you need a dessert or snack, no bake Chocolate Peanut Butter Oatmeal Bars recipe will satisfy your taste buds! 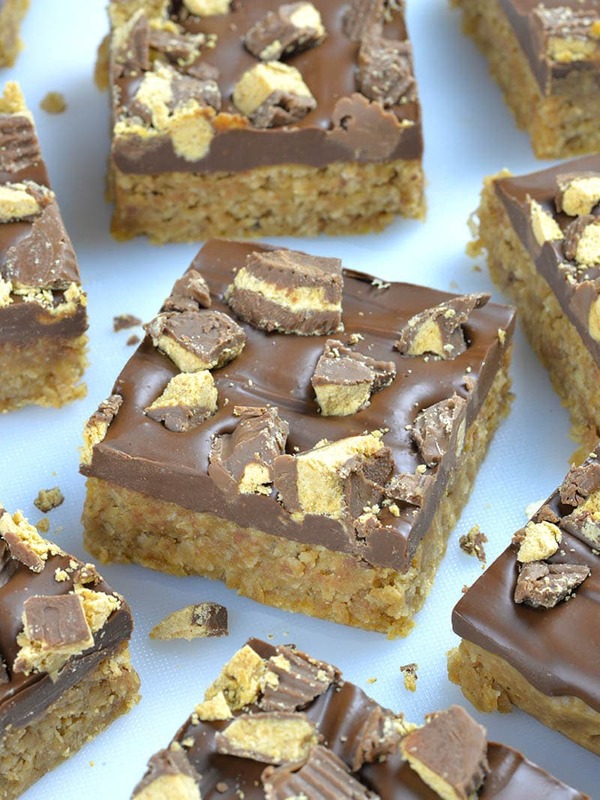 Peanut butter oatmeal bars with chocolate frosting and pieces of Reese’s cups on top, are sure to please. Oatmeal bars are my favorites. They are perfect snack and make ahead breakfast to eat on the go. But they are very satisfying desserts, too. And speaking about oatmeal, you are all familiar with health benefits of oats. Maybe you like to start a day with a bowl of cereals. But, it might be too boring. So, I like to make a little twist on a healthy breakfast. Also, I like to use rolled oats or oatmeal to make a cookies or bars. However, that’s totally acceptable to eat for breakfast. Well, sometimes I carried away and turn an ordinary oatmeal bars in a very rich and decadent dessert. I’m not going to convince you that this Reese’s Peanut Butter Oatmeal Bars are good choice for breakfast. With a thick layer of chocolate frosting and chopped Reese’s cups on top, they certainly are not healthy breakfast. But these Peanut Butter Oatmeal Bars with Chocolate Frosting are super delicious treat. Peanut butter oatmeal bar layer is so flavorful and chewy. But, smooth peanut butter- chocolate frosting takes it over the top. And don’t forgot the Reese’s cups. These bars are peanut butter lover dream come true. Speaking about peanut butter lovers, I’m one of those, as well. So, these no bake Peanut Butter Bars recipe is my new favorite. It uses peanut butter for oatmeal bar layer, but for chocolate frosting, too. Plus, Reese’s peanut butter cups on top. And they taste so good!!! 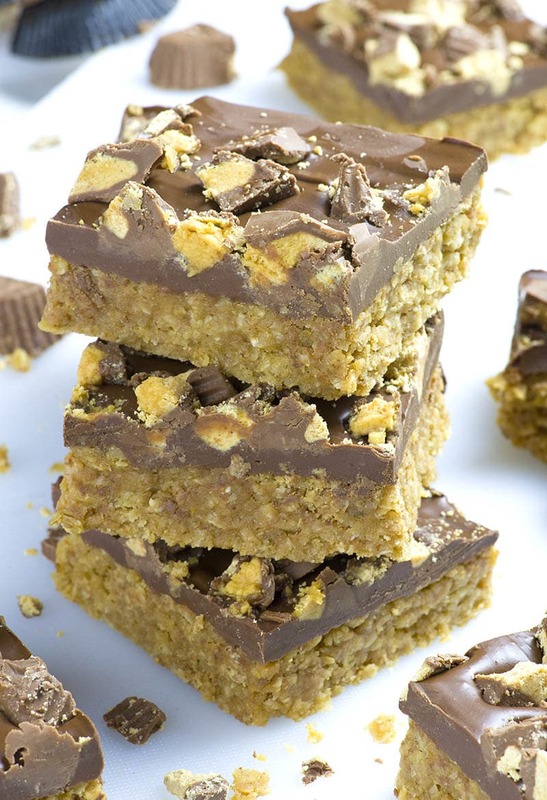 But, here’s my favorite part: this is NO BAKE Peanut Butter Bars RECIPE. That means that you’ll just have to bring to boil brown sugar, butter, milk and peanut butter. Then, stir in oatmeal and vanilla and spread the mixture in the pan. When it’s chilled and firm, top with fudgy and smooth chocolate frosting, slice into bars or squares and enjoy. 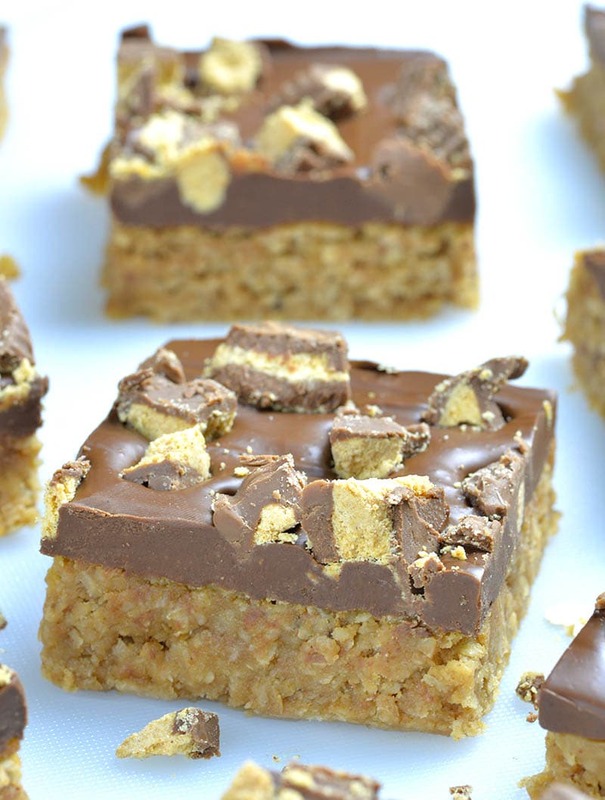 Peanut butter oatmeal bars with chocolate frosting and pieces of Reese’s cups on top, are sure to please.